Architect of the Capitol's (AOC) R.C. "Skip" Vaughn, Capital Projects Administrator, provides a best practices example from the building utilities phase of the Cannon Renewal. In large-scale construction projects, such as the AOC's Cannon Renewal Project, workers are constantly looking for ways to improve the efficiency of their work. Strong coordination and collaboration with other trades is key to delivering a project that's on time and on budget. Even the smallest details can make a difference, and that extends to the drawings used by contractors. It's common construction practice for workers in the field to use paper drawings, which may not contain the most current information. This can cause a domino effect with the other trades, leading to unnecessary revisions and scheduling issues. To solve this problem, the Cannon Renewal Project's electrical subcontractor is prototyping a new way of viewing drawings in the field to ensure the maximum quality of their installations for the AOC. 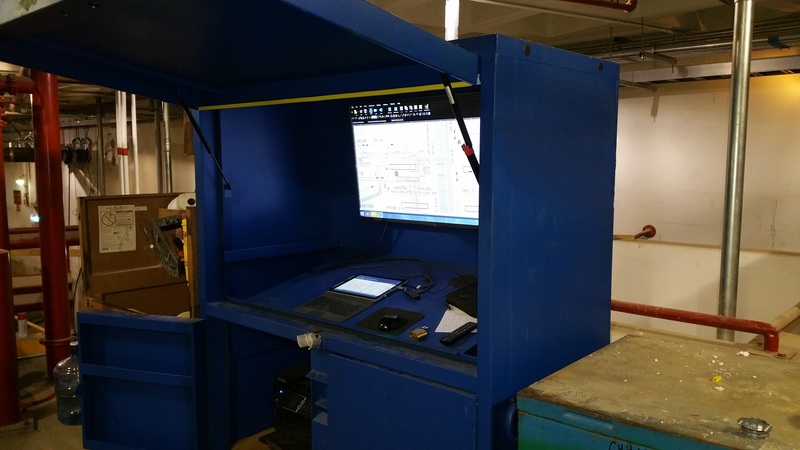 The subcontractor built a kiosk with a computer and flat screen TV to view drawings and contract information in the vicinity of the construction activity. The kiosk even has an Internet connection to the project's database of information. This allows workers in the field to easily retrieve contract drawings, coordination drawings, Building Information Modeling (BIM) drawings, submittals and contract specifications. This innovative approach allows workers to ensure they are using the most up-to-date and complete set of drawings, permitting the workers to certify they are using the right materials and proper installation techniques for each separate work effort. By using the kiosk, the long held practice of having paper drawings in the field, without knowledge if they are up-to-date, is a thing of the past. This 21st-century approach to field coordination and quality control is a model for the future of construction. As the Cannon Renewal Project progresses, we will continue to find ways to increase efficiency and find ways to apply construction best practices to every aspect of the project. The kiosk, computer and flat screen TV is one of the smartest moves I have every seen being used on the CHOBr construction project. What a great idea and this will help with the on-site view of drawings, contract information updates daily and helps the hard working people keep up with this massive construction project, both internally and externally. The workers will be able to retrieve accurate drawings, which is so very important to any successful project! Hats off to the subcontractor and the Prime Contractor for bringing this new idea to AOC. Everyone is working so hard to make this project a success for AOC and keep up the good work!